Hello friends! December's Technique Challenge at Club Scrap is hosted by Artist Team member Roni. 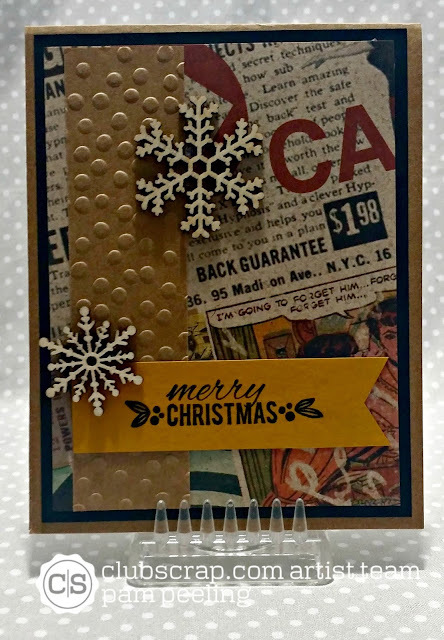 She came up with a challenge to use non traditional colors and images on Christmas cards and to use a bit of glitz! What a fun idea! I ended up making 3 cards for this challenge! I used all Club Scrap papers with some embellishments and stamped images from my stash. I was going through my stash of papers and found the Hypno Special Editions paper...So not Christmassy! I used some mustard colored paper from a past kit to stamp the sentiment on. 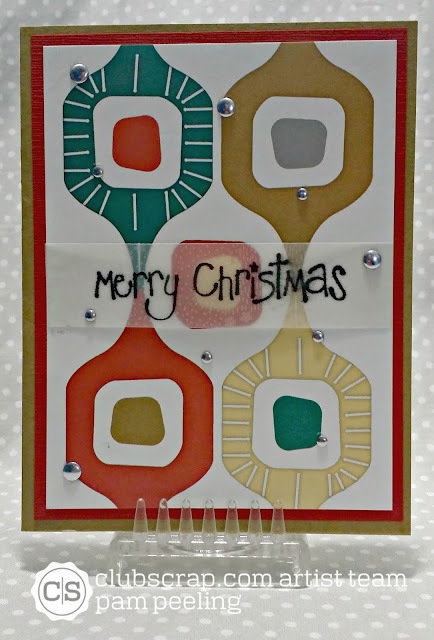 For this card I used the sparkly silver paper that came with the Celebrate kit to matte behind the stamped gingerbread men. The ribbon is also from Celebrate. For the card base I used the plastic feeling blue cover paper from Woven Strands. The background paper is from Office Space. For this last card I used paper from the Office Space kit as the background. I used a piece of patterned vellum from my stash and stamped the sentiment. I used some silver dots as my bling. I really enjoyed this challenge! I'm usually pretty traditional when it comes to Christmas cards and this was so much fun to get out of my comfort zone! Make sure to head over to Club Scrap and link up your creation! Love them all Pam! Looks like you had lots of fun with this challenge. I especially love the Office Space card - I never would have thought to make a Christmas card from it but it's perfect. It's got a great 70's vibe going on. These are wonderful, Pam! Great use of papers for the non-traditional technique.